Mineral makeup has been touted as a healthier alternative to conventional makeup. It is an excellent cosmetic solution for those who are tired of using synthetic and chemical laden products and are in pursuit of a natural alternative. It is a range of pure cosmetics created through natural products. Mineral makeup has gained extreme popularity these days due to the growing interest in the safe, natural and organic products. Several cosmetics companies have come up with their own line of mineral makeup. Mineral cosmetics contain pure minerals that help to enhance the natural beauty of the skin by deeply nourishing it. The makeup blends beautifully and flawlessly into the skin, giving a natural glow. The cosmetics using refined, mineral and organic ingredients have a long history. Many ancient cultures would use ground natural mineral for camouflaging skin discoloration and beautifying the features. The usage of mineral makeup dates back to the times of Cleopatra, when the Egyptians used the naturally occurring minerals to protect the skin from harsh elements and obtain the “divine beauty”. It was customary for the Egyptian women to line their eyes with dark kohl, for which they used an antimony sulfite or green copper carbonate. Mineral cosmetics were a notable part of the daily life of the ancient Romans as well. Makeup was used more as vanity than spiritual reasons. A complexion free from the sun damage was considered as a sign of status and wealth. Redding was combined with beeswax to create a basic lipstick. Zinc oxide was used to get a pale complexion as tanned skin indicated physical labor and lower social status. Mineral cosmetics gained popularity in the 1970s, when Diane Ranger, the founder of Bare Escentuals, developed her line of mineral makeup. What is in Mineral Makeup? In mineral cosmetics, minerals such as talc, zinc oxide, titanium oxide are ground and milled into tiny particles to create makeup. It typically excludes waxes, oil, fragrance, preservative, emollients and other ingredients found in conventional makeup. Mineral makeup products are preservative and fragrance free. The makeup products are micronized to different levels. A product micronized to six times leaves the minerals larger. This provides a light to medium coverage. The product micronized 12 times creates fine particles that sit close and give more coverage. While purchasing mineral makeup, make sure you read the label carefully. If the product says, “Mineral enriched” and has a liquid or mousse consistency, then steer clear from it. The product may contain Paraben or dimethicone, the harmful ingredients used to achieve a smooth consistency. Titanium dioxide is found in beach sand and anatase, a crystalline form of titanium dioxide. Titanium dioxide should not be used unprocessed as it can react with light. The mineral is processed to remove oxidation and increase its ability to deflect the ultra violet rays. Zinc oxide is manufactured from zincate, an orange to yellow zinc ore. This pure white mineral is well known for its anti-inflammatory and anti-microbial properties. It is also used as an active ingredient in sunscreen. The mineral can help treat burns and skin irritations. 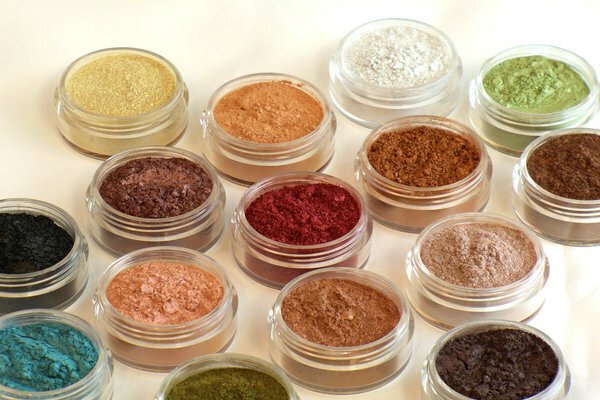 Mica is a mineral silicate used as a pigment in most of the mineral cosmetics. It is available in a variety of colors like black, pale green, blue and is even available colorless. Iron oxide, also known as ferric oxide, is a red colored, crystalline, water insoluble solid used commonly as colorants. The iron oxide should be synthesized in the laboratory under strict process. It should not be used directly due to its high metal content. Bismuth oxychloride is a grayish white inorganic powder used as a binder in mineral cosmetics. It provides smoothness to the texture of the product. Mineral makeup acts as a sunscreen to prevent the skin from sun damage. Titanium dioxide and zinc oxide in the mineral makeup provide protection from the harsh rays of the sun. Make sure you apply a sunscreen with a high SPF if you are going to spend several hours outdoors on a sunny day. Mineral makeup can help clear acne and pimples. The absence of filler ingredients leads to less pore clogging, thereby preventing the onset of breakout. Zinc oxide is an FDA approved skin protectant. The anti-irritant properties of zinc oxide can help soothe inflammation and irritated skin. However, it is unlikely that mineral makeup will clear the pimples caused due to hormonal changes. Conventional makeup products contain oil, chemicals and other additives that irritate the skin, leading to breakout. Mineral makeup is safe as it adheres to the natural oil present in the wearer’s skin and does not get in the pores. The fine mineral particles provide a sheer coverage, without creating a thick layer of makeup. This allows the skin to breathe, which most of the conventional makeup products do not offer. The ingredients present in the mineral makeup soothes the irritation, even out the skin and blends beautifully with the skin’s natural oils. Mineral makeup is much more versatile than other makeup products, provided you use it well. You can mix some water with the powder foundation to make a liquid foundation. The loose mineral pigments also have a plethora of uses. It can be used as eye shadow, eyeliner, hair highlights, colored mascara, nail paint, dyes and lip-gloss. Mineral makeup has a long and stable shelf life. Conventional cosmetic companies add fillers and additives in their products to extend their shelf life. However, mineral makeup is free from preservatives and has a better shelf life. 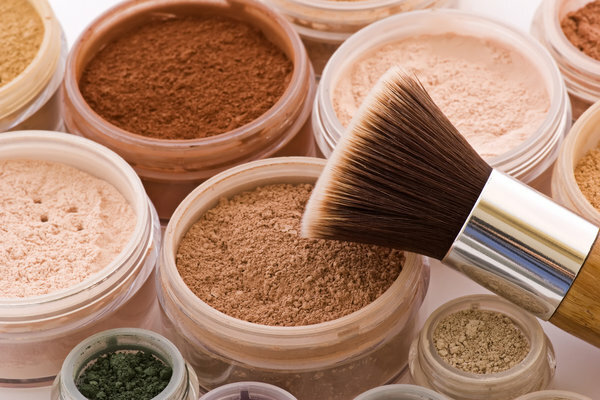 Mineral makeup products contain a very few ingredients. The base ingredient of mineral makeup is mica. The conventional cosmetic companies use talc as their base ingredient. Talc provides a soft texture to the product. However, the adhering properties of talc are nothing when compared to mica. Mica has excellent skin adhering properties and is less chalky as talc. The pigments present in mineral makeup last really long on the skin. A little of the mineral makeup goes a long way. A pea size amount of mineral foundation can give light to moderate coverage. You can use a concentrated amount of product for a heavy coverage. The traditional makeup product contains preservatives that are used to extend the shelf life of the cosmetics. These ingredients can cause hormonal disruptions, leading to breast cancer and heart problems. Women spend a great deal of time to find products suitable for their skin tone. Some products work for oily skin, while some are beneficial for the sensitive skin. The ingredients present in mineral makeup are suitable for all skin types, be it sensitive or acne prone skin. The mineral is hypoallergenic and are suitable for all skin tone, including dry skin. Mineral makeup is extremely soothing. It can be used safely after chemical and laser peel. The intense cosmetic procedures involved in these treatments leave the skin red and irritated. Applying concealer will cause burning and itching as it contains chemicals than can interact with the exposed skin. Mineral makeup is gentle enough to blend totally into the skin and conceal the side effects caused due to the skin treatments. Mineral makeup is ideal for women suffering from skin conditions like acne, rosacea and eczema. It also soothes and heals the skin with its natural combination of the earth’s mineral. According to some studies, the nanoparticles present in the mineral makeup can penetrate the skin’s barrier, leading to harmful reactions. Some mineral-based makeup products contain bismuth oxychloride, a white powder base. The ingredient is added to give the cosmetics a pearly finish. Bismuth is a toxic substance and sould be used only when it is refined and tempered with the other ingredients. Mineral makeup does not last as long as the conventional makeup as it does not contain standard cosmetic ingredients like binders and waterproof polymers. Mineral makeup has just a limited number of shades, so it will not be easy for you to get a perfect shade for your skin tone. Mineral makeup can leave the skin looking dry and chalky, particularly in women with oily skin. The powder present in mineral makeup absorbs the natural oil from the skin, leaving it slightly darker and clumpy.